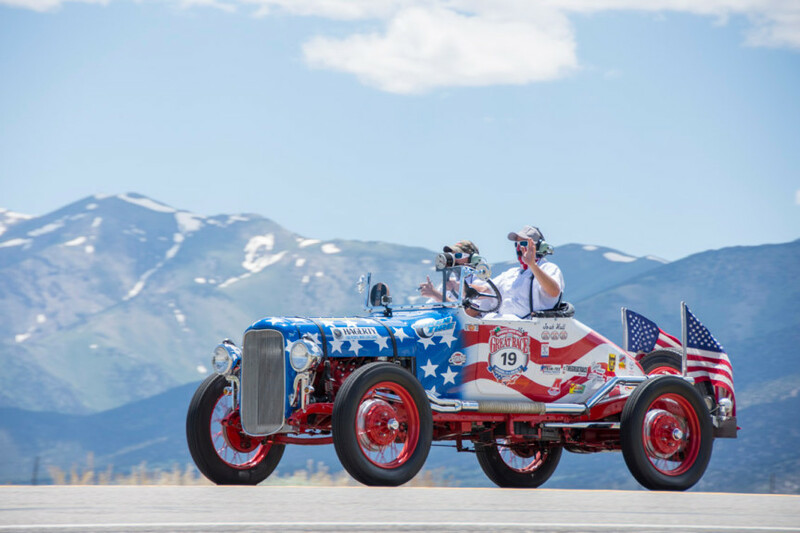 The Great Race » Great Racers Roll into Ohio! Great Racers Roll into Ohio! Whew, it’s hot! Today’s route was challenging enough on its own, but when you add heat and harsh sunlight into the mix, it certainly gets interesting. We’ve been blessed with great weather during the multi-day event, but we definitely had summer-like conditions during today’s epic drive. We started the day in front of the beautiful Adam’s Mark hotel in downtown Buffalo, New York. Jody Knowles and Beth Gentry on a nice country road during today’s route. One of our Great Race bloggers, John Corey got the primo parking spot this morning at the Adam’s Mark hotel in Buffalo! Jeff and Eric Fredette proudly waving the American flag during their speedometer calibration this morning! After navigating traffic, and finishing the speedometer calibration we made it off the highway and onto some of the most scenic roads in New York. From there, we entered Pennsylvania, and found ourselves crossing the Allegheny River. More intense rallying led us to our lunch stop in beautiful Franklin, Pennsylvania, where the town had come out to greet the racers. And Franklin’s lunch was top notch!!! Tevie Smith’s Chrysler is a little rough around the edges, but it sure gets a lot of attention! Harper & Blair are heavy hitters in the running for Grand Champion, and pass part of the Allegheny River on their morning route. The Beerster Boys riding in style during this morning’s speedometer calibration run. The lunch stop in Franklin, Pennsylvania had a great crowd, and the food was phenomenal! From there, racers worked their way into the rolling farmland of northern Ohio and had a very challenging maze created by our Rally Master, John Classen. The maze involved a four-way stop, on a rough road that caused more than a few screeching tires as racers slid to a halt. Then, they would drive a few miles, and circle around to the four-way once again, from a different direction, meaning that they would intersect with other racers. This always makes for interesting action, so we stuck around and captured all of the action. The Martins pose at the four-way stop, waiting for the precise time to hit the throttle. Mazes are always challenging, especially when cars are cornered at opposing stop signs! Check out Jim Menneto’s facial expression as he slides to a stop in the loose gravel that made the four-way stop maze even more challenging! 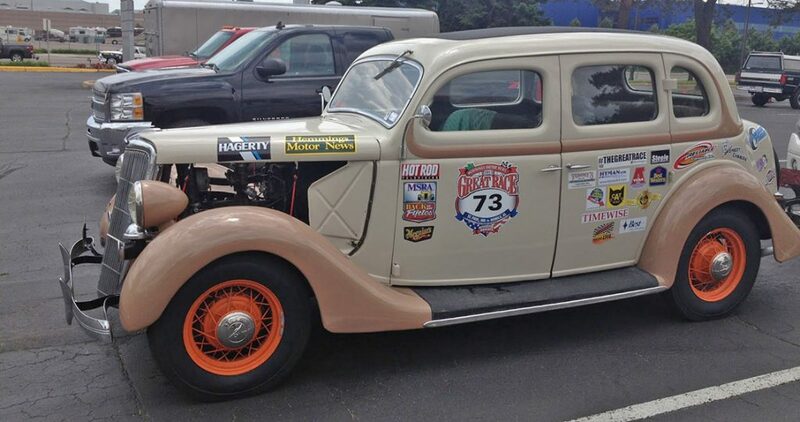 Rex Gardener is an important part of the Great Race, and he rallies this awesome ’35 Ford coupe with his grandson! We then made it to our final destination of the day–the Packard Museum in Warren, Ohio! 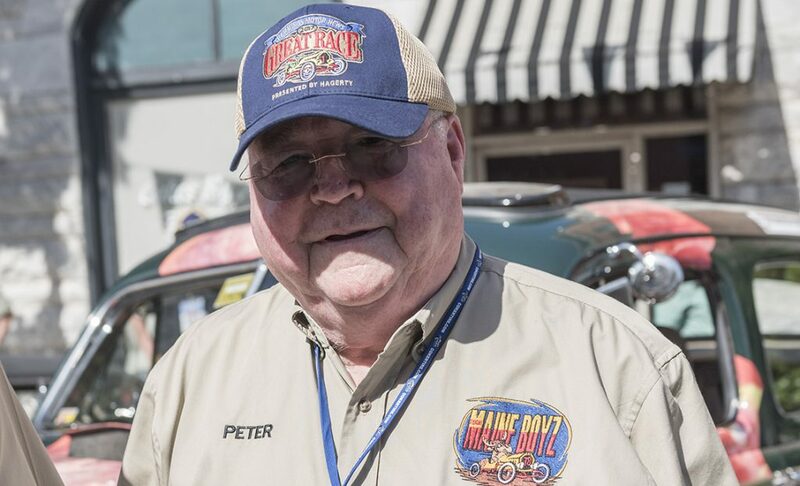 The place was packed with spectators, and they got a special surprise as the Hedke family rolled into town in a rental car. 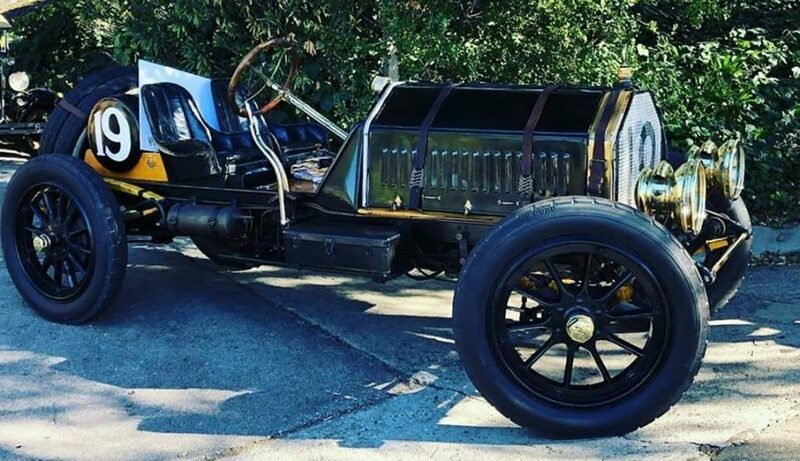 Although they will not be officially scored among the other racers because they are driving a car that is too new for the rules, the Hedke’s are timed just like everyone else. Even though they were sore, the Hedke’s scored an ACE award, meaning they were dead-on perfect on one of their legs. It was great to see them back in action, and we’re just glad they are doing ok after their accident! A great crowd in Warren, Ohio!!! Steve and Janet Hedke coming through the finish line gate to the delight of the crowd. The Packard Museum was awesome!!! Great food, and great hospitality made it a fun stop for all of the Great Racers! For now, let’s take a look at more of today’s pictures, and if you like ’em CLICK HERE for even more! My son Sean and I were in attendance at the arrival in Warren this afternoon and boy, were we treated to some awesome machinery! We hope all the “Great Racers” enjoyed Warren as much as we had having you here! We will pray for all of you to return safely, both to Michigan and then back to your hometowns! Thank you again, GreatRace, for posting the beautiful pictures!! Being part of the support crew in the 1998 GreatRace X-Cup from Titusville, FL, your photos have made me feel like I was “almost” there. Maybe another year if my son, Chad Nelson, Car #30, 1930 Ford Model A Speedster, is back next year. Praying daily for all. Driving down 76W this morning it was a spectacular sight to see all the love and care that goes into these oldies! Seeing you guys with goggles on and ear muffs it makes me appreciate the comfort of a front windshield and a roof! Hope you all good weather, good people and good luck on your journey! We just finished watching the cars go by as we sat on our front porch here in Sullivan, OH. Our Amish neighbor kids really enjoyed all the waves and horn toots. It was an awesome enjoyable morning. Thanks and hope all have a safe trip to the finish.